Pizza and crust dips make me one happy woman. Ok, make that freshly stone baked pizza. With toppings which give something a little different. Not asking for much am I? Recently the work girls and I headed out for Musical Bingo. But before singing your hearts out, you just have to fuel up. Lucky for us, Musical Bingo was right underneath Pizza East. One pizza spot I was dying to try. It had been on my list for too long. Pizza East looks and feels a lot cooler than some of the recent pizza spots I’ve visited. It’s got a contemporary warehouse feel, with low hanging huge lamp shades and long sharing benches, as well as smaller tables. It has elements of the diner feel, through it’s chequered napkins, but it’s definitely somewhere a touch towards the more fancy end. You could easily do date night here. The menu doesn’t just feature pizza. That one had me. 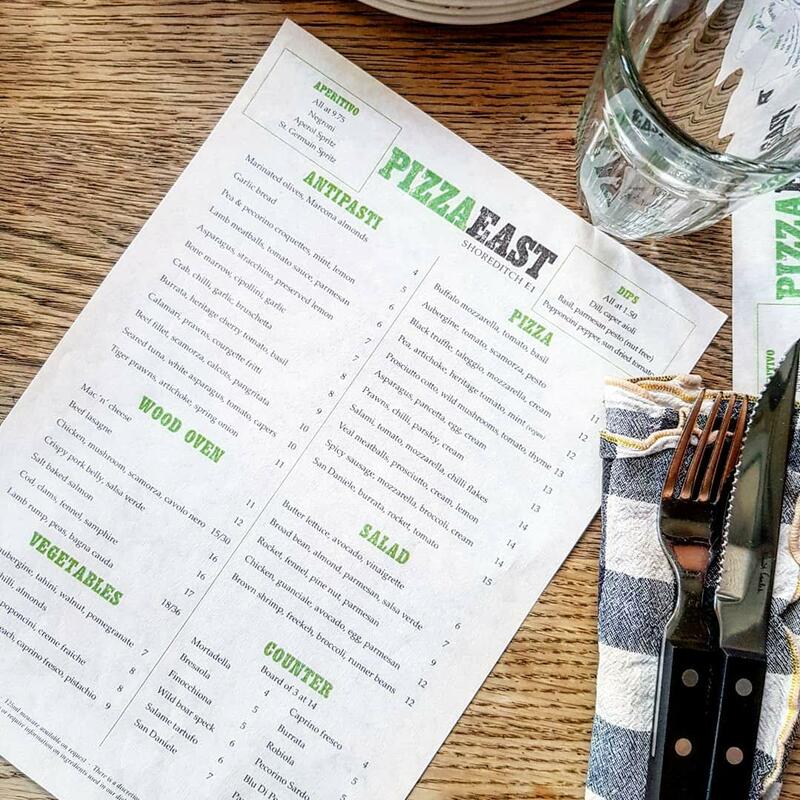 It might be called Pizza East but its actually an Italian. Does that mean you HAVE to have pizza. Well, yes. But no, not really. There are also ‘wood oven’ dishes, including beef lasagne, salt baked salmon and mac and cheese – which always catches my eye as we know. There are some delicious looking veggie dishes too. One too good to ignore, we just had to order it to share before our main, alongside another dish from the small but varied starter menu. 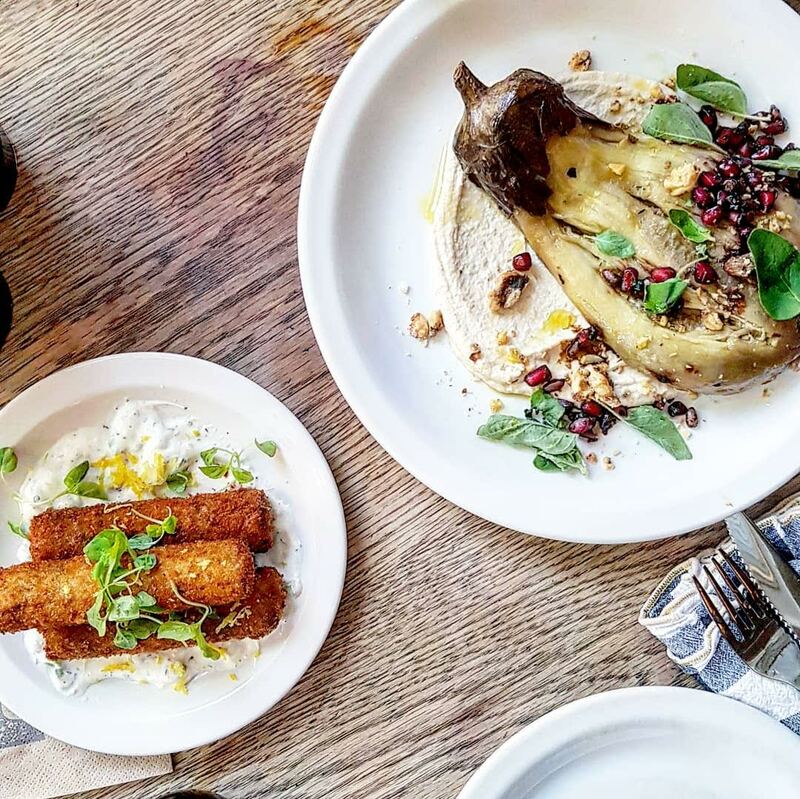 The pea, pecorino, mint and lemon croquettes are a must-order. They’re lightly coated and crisp, but soft and delicate in the middle. The flavour was beautiful. Almost fresh with a light cheese coming through. These were a HUGE hit around the table. The burnt aubergine was fantastic too. 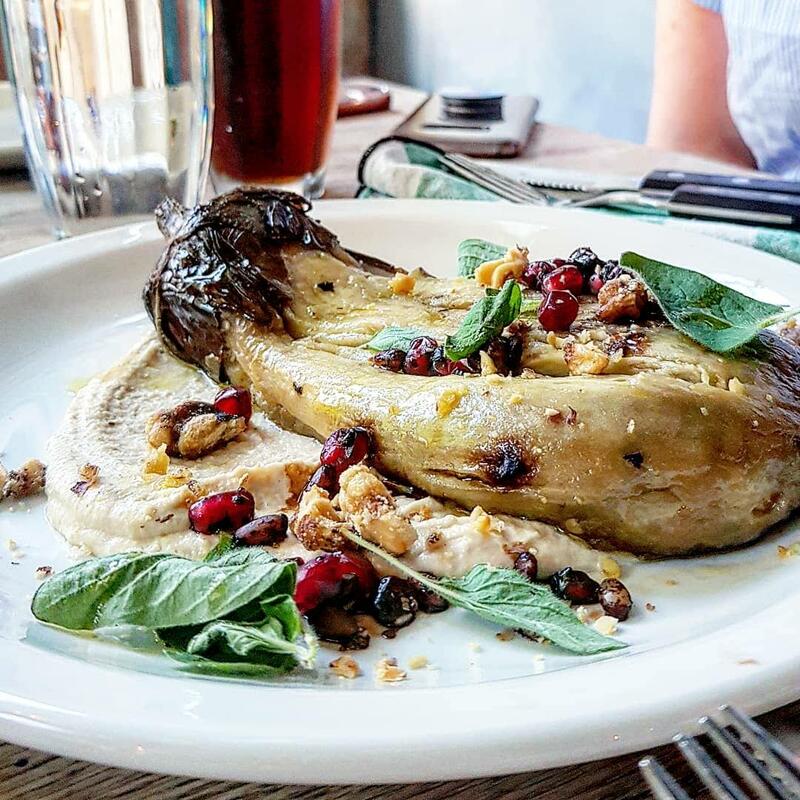 Served with rich tahini, mild and just crunchy walnuts and juicy pomegranate it was a superb mix of flavours and textures. The burnt aubergine itself was super soft, almost slow roasted. All of our pizzas looked delicious. A table full of pizza is a good sight right?! The margarita is always said to be how you can tell a good pizza place. Being one of the girls go-to orders, she was obviously placed to comment. This did not disappoint. With buffalo mozzarella, it was up there with the best in her mind. I had the aspargus, pancetta, egg and cream. The asparagus was shaved rather than chunky, adding enough flavour and being easier to eat as a pizza topping. The pancetta was crispy, and smoky in taste – it was definitely worth having meat that night for this! I’d never had egg on a pizza before. It’s actually one of the reasons I picked it. The slightly runny yolk adding a fantastic touch. I loved it. Definitely something I’m going for again. I didn’t miss the tomato base at all, with the toppings combining with the cream to make one fab pizza. The Aubergine, tomato, scamorza, pesto and the Veal meatballs, prosciutto, cream, lemon pizzas both went down extremely well too! There are plenty of drinks to choose from too. Parched from the heat, a diet coke hit the spot but I was eyeing up the cocktails and Aperol spritz too. We couldn’t quite manage a dessert, and were due to head downstairs for the fun bit of the evening. However the menu did look good, and the Peanut butter & chocolate brownie parfait and Basil panna cotta with strawberries definitely nearly had me. Price: Pizzas are priced between £10 and £15. The other dishes range from £7 to £18. 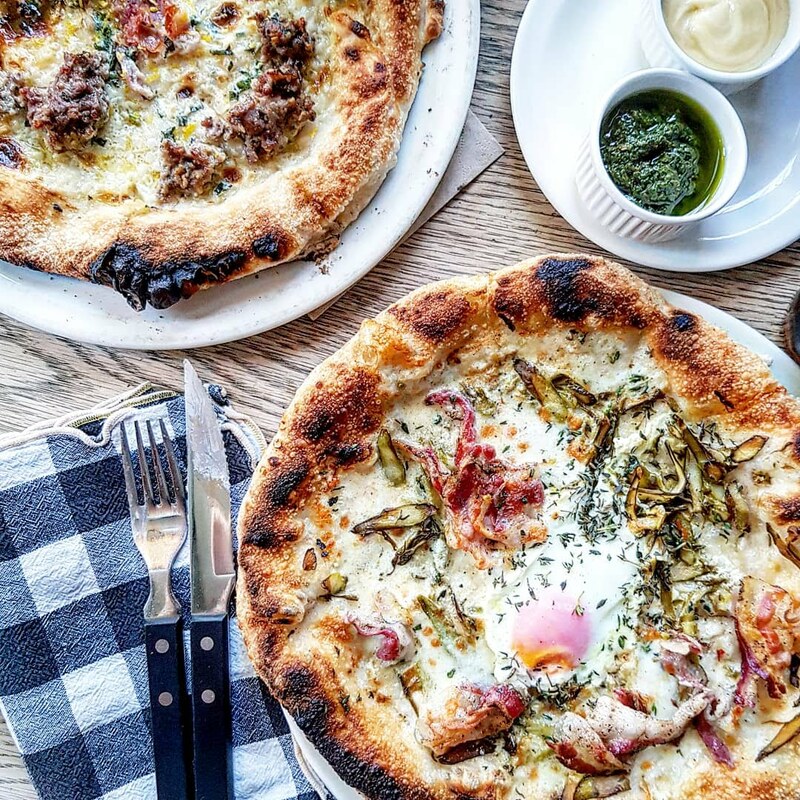 It is slightly more expensive than artisan pizza spots, but if you’re after a fancier location it is worth it. 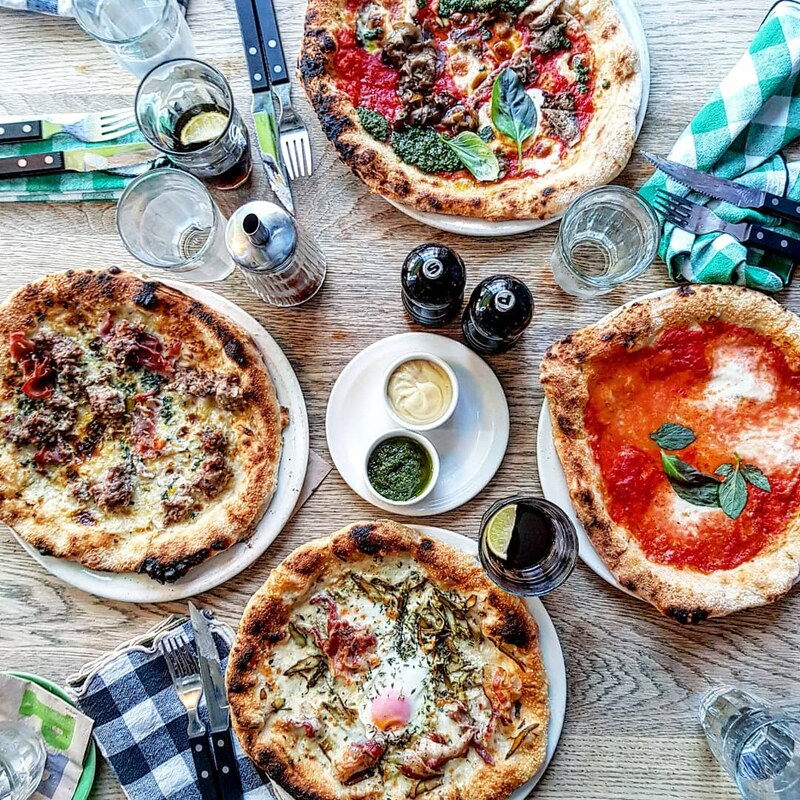 Food: There are options other than pizza, but … you HAVE to get a pizza. Go for the pancetta and broccoli! 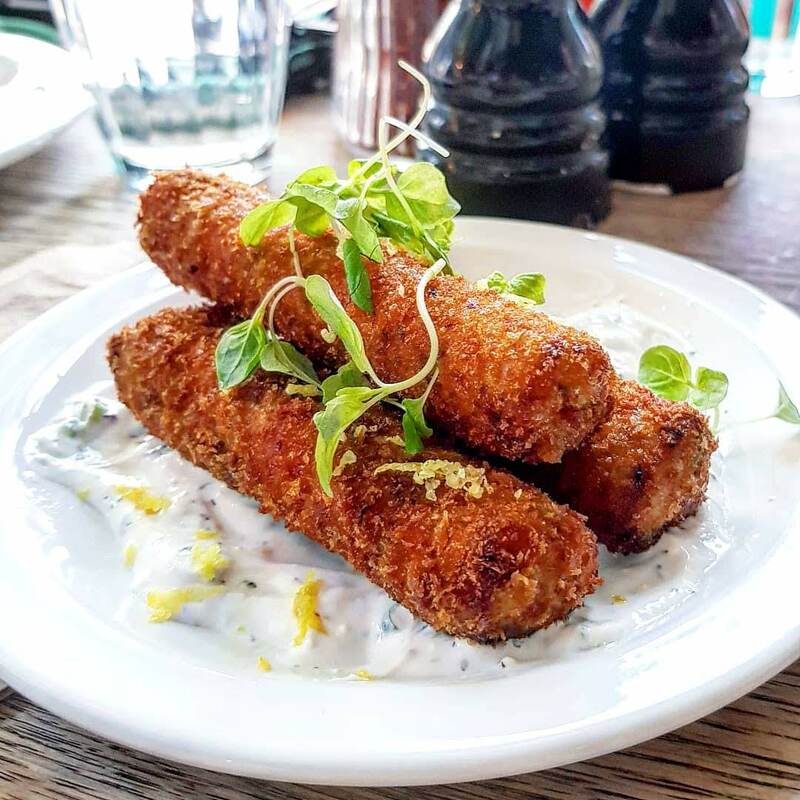 The croquettes are a must if you’re having a starter. Drinks: Plenty to choose from, including cocktails. Atmosphere: An upmarket pizza diner. Contemporary warehouse. Could easily be a date night spot! Wait: Do try and book. We managed to get a table we could have for an hour and a half before the reservation arrived. 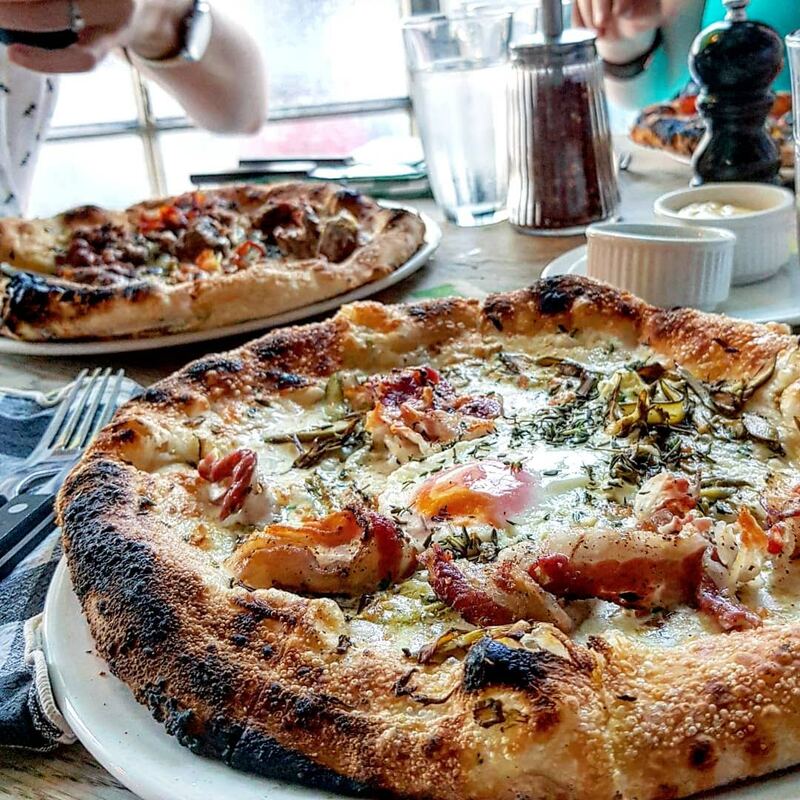 Have you been to any good pizza spots I should try recently? What’s up with the takeaway sweetcorn trend? Loving the slightly different tomato-free topping options – egg on pizza is soooo good!